We already know that, Bonnard was a dog or, at least, represented himself as one. 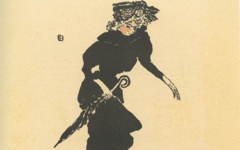 We discovered that in examining one of his best-known prints, Women with a Dog (1891). Besides, you can see under the theme Artist as Animal numerous examples by other artists as well. 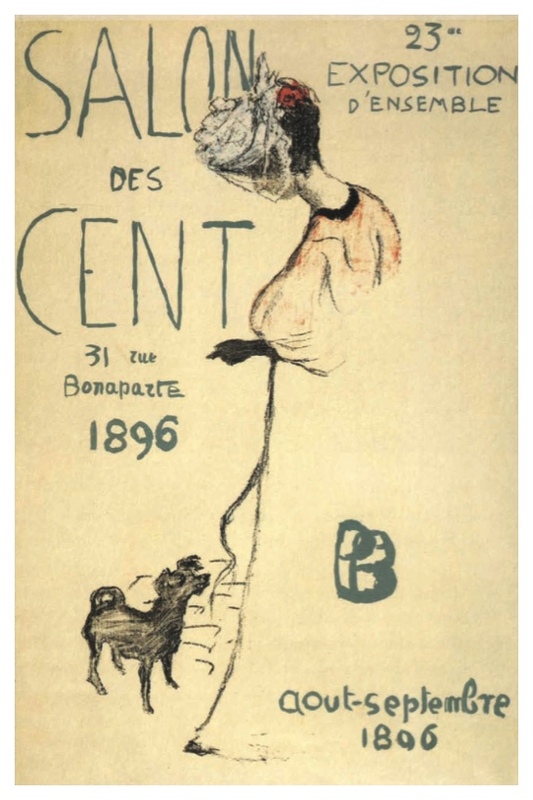 Another print by Bonnard, a poster for an exhibition known as the Salon des Cent (left), makes the dog his alter ego again. I am using it in part because, while Bonnard’s mature paintings can often be puzzling, the features in these early prints are honed down precisely facilitating the sharpening of our own interpretative skills. Nevertheless it would be natural to presume here that the prominent canine “is” Bonnard because, if nothing else, tradition in art runs deep. My eye at first saw the dog’s tail, however true-to-life it may appear, as unusual, perhaps even a bit forced. Besides, its curl echoes the P of his monogram nearby while the rear paw bending rightwards from the leg beneath it also resembles the curve inwards of the P’s stem. That feature of the P is unusual too. 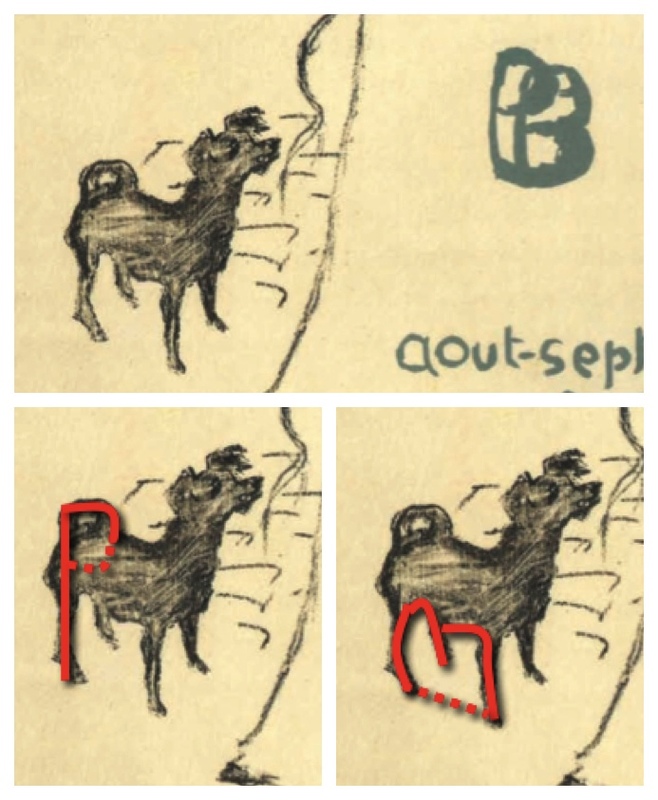 All I had to do now was look for the B which I found, I believe, in the negative space between its legs (lower images). 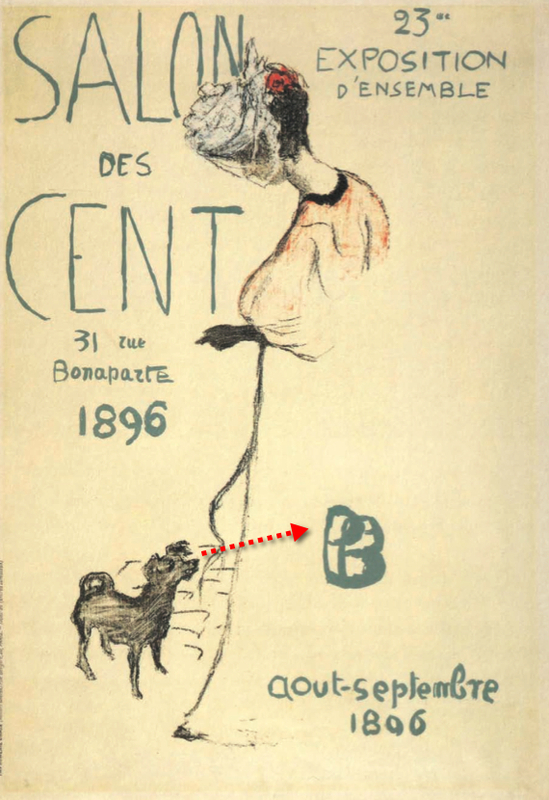 For confirmation, see how Bonnard varies the same idea in The Pushcart (c.1897). As in depictions of so many other female figures in art, by many different artists, this woman emerges from the “veiled face” of the artist. These “faces” are rarely seen by anyone except artists. 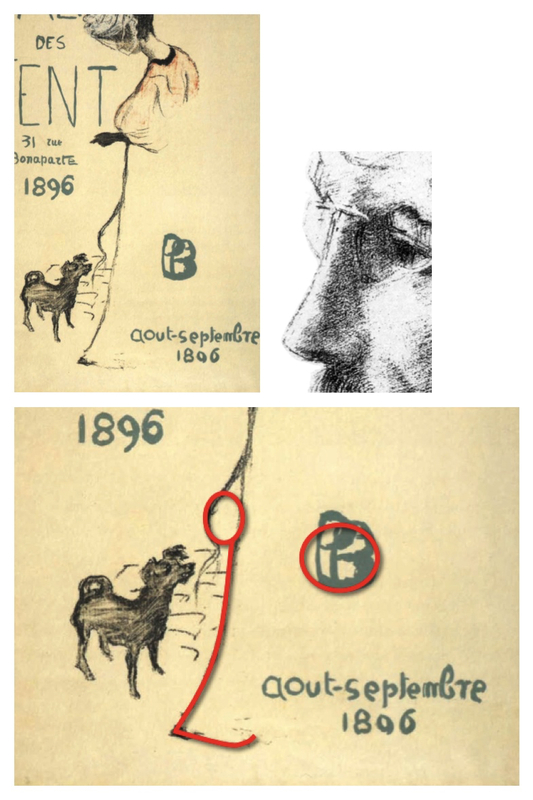 The features, if you can call them that, hardly resemble Bonnard – the nose is stick-like - but they so clearly carry meaning and so closely resemble works by Rubens, Rembrandt and others, that there should be little doubt among those familiar with them.1 Take a look at the diagram below. The “eye” nearest to us is Bonnard’s own monogram; the far “eye” though formed from the woman's dress is breast-shaped thereby conveying its fertility. The fit of form and meaning in each eye makes the odds of coincidence here very remote. 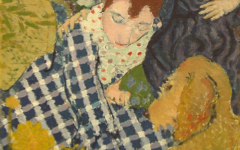 Bonnard has created a mental image of his own head with the woman emerging above his eyes. We are inside his mind. That’s why her hand is so boldly-drawn with its finger lengthened. (As many may now know, a pointing hand often signifies a painting one. )2 It is the hand of an artist directly above his “fertile eye” thereby linking craft (hand) and imagination (eye). She is the female portion of the artist’s non-gendered mind, one that represents and reflects all humanity, not just the male half. 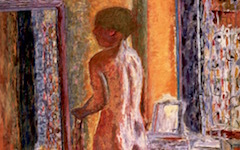 She faces inwards not only to “draw” the poster but to indicate that Bonnard, like artists before him, look inwards too. Lastly, borrowing a subtle technique Mantegna used so brilliantly in The Adoration of the Shepherds (c.1450-51), Bonnard directs the dog's gaze not where you might expect it, at the woman's "commanding" finger, but directly at his own monogram. It strengthens the conveyance of his meaning while indicating to those aware of such things, primarily artists, that the apparent scene is an illusion. Not the illusion, often assumed by ancient and modern scholars, that paint resembles life, but the illusion that what you see is. 1. See examples here under the theme Veiled Faces. 2. See the theme Pointing and Touch. Original Publication Date on EPPH: 06 Jul 2013. © Simon Abrahams. Articles on this site are the copyright of Simon Abrahams. To use copyrighted material in print or other media for purposes beyond 'fair use', you must obtain permission from the copyright owner. Websites may link to this page without permission (please do) but may not reproduce the material on their own site without crediting Simon Abrahams and EPPH.